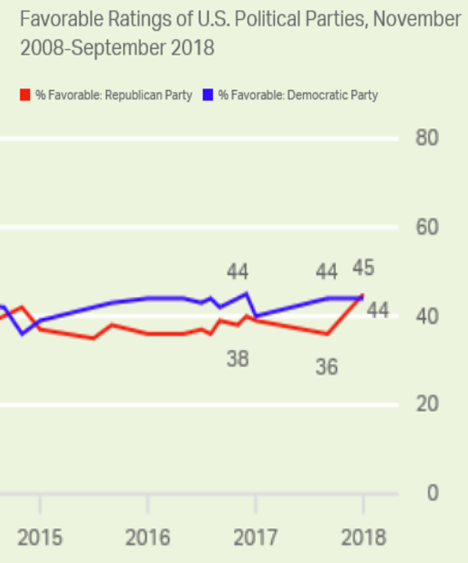 Again, in the past year, GOP favorability increased by 9 points and is now essentially tied with the Dems. The polls “internals” – the parts that make up the whole – are interesting. 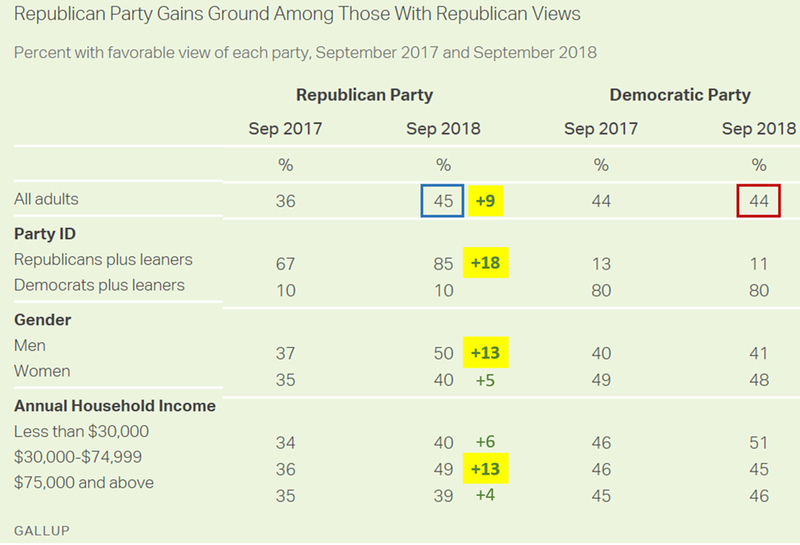 There was an 18 point swing among those self-classifying as Republicans or Republican-leaners. Possible explanation: Never Trumpers are accepting Trump’s abrasive style since it seems to be delivering results in the economy, in the courts, and around the world. There was a 13 point jump among GOP men and a 5 point gain among GOP women. Finally, there was a13 point jump among those earning $30,000 to $75,000 … the middle class that Trump promised to help. Apparently they disagree with Pelosi and think that this administration is delivering more than just “crumbs” . Technical note: Again, the survey was conducted before Kavanaugh’s raucous confirmation hearings. The effect of the hearings? This entry was posted on October 17, 2018 at 6:59 am and is filed under Party favorability, Polls & Surveys. You can follow any responses to this entry through the RSS 2.0 feed. You can leave a response, or trackback from your own site.